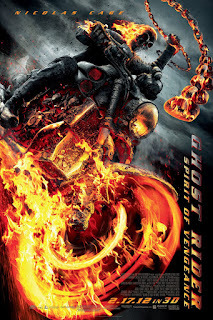 Ghost Rider was a nice movie, it’s one of those movies that makes you say “This s**t could happen”. But when you see this movie you say “What the f**k!” cause it’s just so disappointing and irritating! A lot of scenes in the movie are unwanted and the story is nothing new, it’s the age old Antichrist story, with the son of the Devil born in the earth and bla bla bla! Here’s the definition of the cliché that writers call "story"- The son of Satan is born on earth and his name is Danny (Fergus Riordan) they might as well have called him Damien. Well anyways, Danny is being chased by the Devil (Ciarán Hinds) because the Devil wants to enter into a vessel that is strong enough to contain his power which FYI comes in season 5 of The Supernatural. Now Johnny Blaze (Nicolas Cage) is called in to save the boy and all of humanity from the Devil and if he succeeds, his curse will be lifted. Yes the curse he got when he made the deal with the Devil in the first movie, I mean it’s one of the coolest curses ever!!! Why would someone want to get rid of it? If I had the ability to transform into a burning skeleton and ride on an awesome flaming bike and kill every as**le that gets in your way, I’d be happy. To me it doesn't really sound like a curse, anyways that's the story. I don’t know what went wrong in this movie but something did, well almost everything did. It’s boring and makes you realize that you’re wasting valuable time, time that you’ll never get back. Nicolas Cage gives a weird kind of performance, can’t quite put my figure on it, it's just plain “What the f**k is he doing?” weird performance. The visuals are good but the cinematography is bad, the camera is constantly shaking and you don’t even know what’s going on. Overall it’s a sad excuse for a sequel. Regret - If you want to know the exact definition of this word, watch this movie.